GRAND RAPIDS, Mich. - Furniture manufacturer Herman Miller, Inc. (NASDAQ:MLHR) earned the WorldatWork Seal of Distinction, a a recognition of excellence that recognizes companies who provide a beneficial workplace experience for balancing work-life concerns. Herman Miller is the only furniture manufacturer among the 160 companies across the U.S. and Canada that will be honored at the WorldatWork Total Rewards Conference & Exhibition May 7-10. Herman Miller offers its employees a highly competitive package of benefits designed to promote health, wellness, and work-life balance. Some of the more unique benefits include concierge services, Teladoc, paid parental leave, paid volunteer days, tuition reimbursement, adoption assistance, flexible work arrangements, phased retirement program, on-site fitness classes and facilities, and fitness club reimbursements. This year’s Seal of Distinction recipients are from a wide range of industries and hail from 35 states, the District of Columbia, and four Canadian provinces. 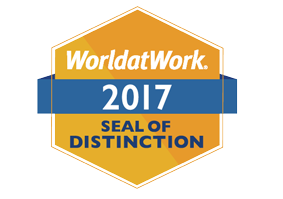 Developed in 2012 by WorldatWork, a nonprofit human resources association and compensation authority, the prestigious Seal of Distinction measures the overall strength of an organization’s work-life portfolio and success in creating positive work environments. Applicants are evaluated on work-life programs, policies, and practices that meet the needs and challenges facing employees today, such as caring for dependents, health and wellness, financial support and education, paid and unpaid time off, and workforce experience and engagement.